Busy day today - various things commencing and whatnot. 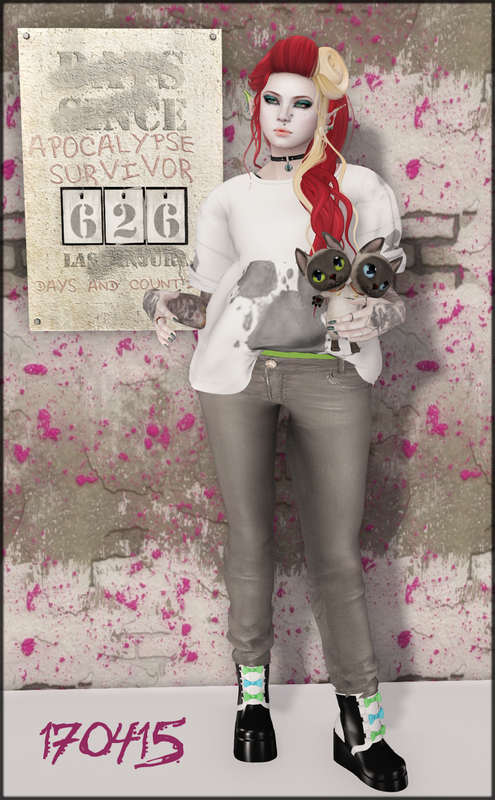 I started my day in SL by starting the exciting new Wayward Hunt, which is a rebranding of the venerable Zombie Popcorn event group, but it turned out I'd jumped the gun, since it didn't actually start until 1pm SLT, and here I was excitedly running around at like, 5am or something. Stupid timezones. So I plan on picking that up again after I've finished this post, since there's some cracking stores along that trail. Instead of that, I did the also just-started-today TAG Gacha thingy, which combines the hopping from store to store nature of a hunt with the wallet drainingness of a gacha event! Um but I made it sound much less fun than it is. You wear a HUD and it teleports you to each shop and you click the thing there to show you've been there, and then there's a gacha machine you can optionally play and in each machine you have the chance to win a Rare ticket for a special prize at the end! Phew! The theme for this round is circus sideshow and there's plenty of creepy cute greatest show on earth stuff to play for along the way! It's where I met my little friend(s) here, Sai-Khwa, the two-headed monster of Thailand! Lassitude & Ennui's machine is packed full of a circus of cute and special cats, all of whom have their own little story, there's more to Sai-Khwa than meets the eye! My shirt is by Offbeat at Xiasumi School Festival and I liked it because the ink blot looked like Mickey Mouse. I bought it on hyasynth Tiramisu's recommendation and then I bought the pants she recommended too and then was for some reason startled today when I went to see her and we were dressed the same-ish. On the one hand, I should probably be more original, on the other hand, I could have a much worse occasional stylist than her. My awesome hair is by Olive at The Kawaii Project. I remember a few years ago, just before mesh was a thing, streaked hair was all over the place and I loved it, throwing a blonde streak all up in there. It's rarer now but I always jump on it when it's an option. My eye makeup is gorgeously layered and by Wicked Peach at Black Fashion Fair which also opened today because today is apparently epic. Oh, and my poster is by Frogstar at The End, a post-apocalyptic event which didn't open epic-today, but yesterday, which is close enough. The numbers on the poster can be changed. I chose 626 because of reasons, and if you can guess my reasons, you can be my friend!